enough just the way they are, and a place in congregational life. Nursery Care: Our nursery is available for families 10:00am-12:00pm each Sunday. Our staff team reads stories, engages in imaginative play, and creates an environment of belonging for our youngest children. Families are also welcome to use the family room located at the back of the Main Hall or to have their children in the Main Hall with them. We offer these three options to support families in whatever way we can on Sunday mornings. Religious Education: RE is comprised of worship, educational opportunities, service, and justice-making. On any given Sunday, our children are engaged in one of these activities. RE is a partnership between our staff, volunteer teachers, and the family. We know religious education and faith development need more than 1 hour each Sunday. As such, we provide resources for parents to further their own religious education, talking points for around the dinner table, and resources for families to continue faith development throughout the week. Worship: We begin together in the Main Hall each week to experience worship as a whole community with all generations present. 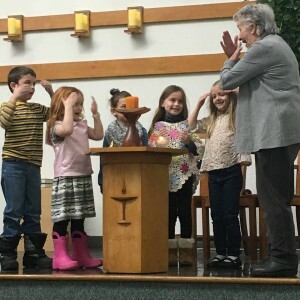 We believe worship is a critical part of religious education for our children and youth and that our whole community benefits when we are together. For this reason, we remain in the Main Hall for multigenerational worship 1 Sunday each month. In these monthly worship services we encourage children and youth to participate as part of the liturgical team.